and called to celebrate, learn, and serve. Peace Lutheran Church is a member congregation of the Evangelical Lutheran Church in America. The first service ever held for Peace was conducted by Rev. Stan Sultemeier on October 2, 1977 in the cafeteria of A&M Consolidated High School with 162 people in attendance. The original sanctuary for the church, now serving as our fellowship hall, was constructed in 1979-80. Three major capital improvement projects over the years added the Student Center, the current Sanctuary, and the educational wing expansion on the fellowship hall. Peace is lead by a great pastoral and volunteer team. Together they guide Peace’s major mission areas including Habitat for Humanity, Hospice Brazos Valley, Brazos Church Pantry, and Family Promise. Peace is also the home parish for Treehouse – ELCA Campus Ministry of the Brazos Valley – the campus ministry program serving students at Texas A&M University and Blinn College, including its main campus in Brenham. The congregation is now the church home to 478 baptized members and 271 households. 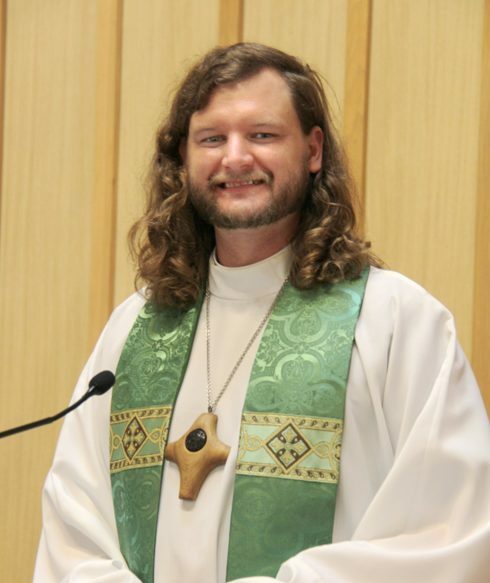 Pastor Travis Meier previously served at Bethany Lutheran Church in Fredericksburg Texas for four and a half years. He is a native Texan, born and raised in Brenham. He graduated from Texas A & M University with a Bachelor of Arts degree in December of 2008. While a student, he was a member of the Corps of Cadets and the “Fightin’ Texas Aggie Band.” Travis earned a Master of Divinity from the Lutheran School of Theology at Chicago and was ordained as a Lutheran pastor in 2013. Pastor Travis embraces the new mission statement and is fully engaged to move Peace Lutheran forward to celebrate in worship, sing and journey through life together as well as to help us grow in faith and reflect God’s Word in our daily lives as we respond to serving the needs of the community both physically and spiritually.